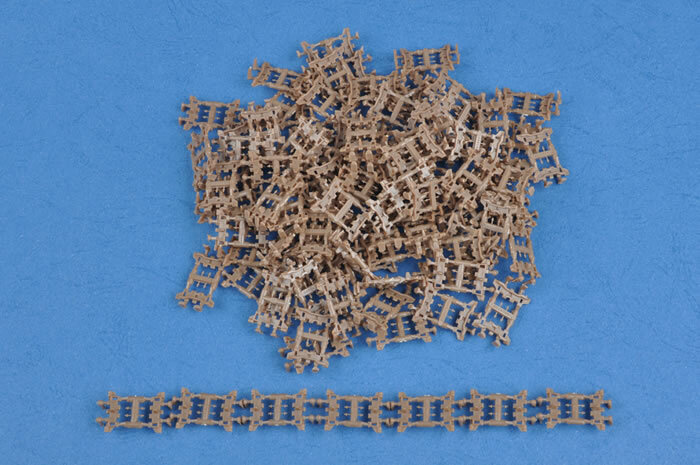 Advantages: Crisp detail; good fit;moulded non-slip texture; excellent individual track links. Recommendation: The model goes together with typical Hobby Boss ease, and with only some minor detailing such as crane conduits, aerials and a mix of road wheels, will look fantastic. 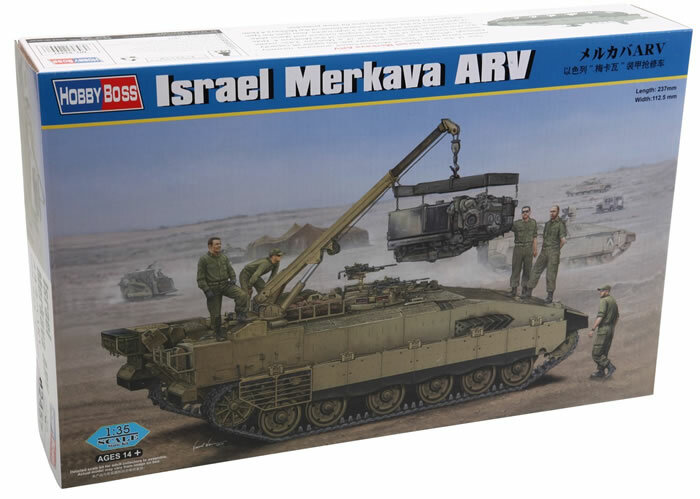 Based on the Merkava 3 chassis, Hobby Boss has chosen to represent one of only two prototype light duty ‘Namer Achzaka’ or Merkava ARV (armoured recovery vehicle) that the Israeli Defence Force (IDF) developed to replace the ailing M88A1. Although the ARV is built on a Merkava 3 chassis, it looks more like a Merkava 4 due to its development history as illustrated by the vehicles new heavy duty side skirts, hull integrated exhaust and simplified look to the top and front of the hull. The ARV was actually one of the Merkava 3 ‘Namer’ APC prototypes that were trialled as an ARV after development of the Namer APC was completed and went into production on the Merkava 4 chassis. However the ARV project was cancelled due to either budget cuts or suitability, depending on the source of the information, and the M88A1 remains in use with IDF armoured formations to this day. The light and heavy prototypes still managed to see action in the 2009 Operation ‘Cast Lead’ where they supported the Israeli armoured brigades, although the model is depicted without the Low Intensity Conflict additions such as mesh screens over hull openings, ram and belly armour seen on one of the prototype ARVs. 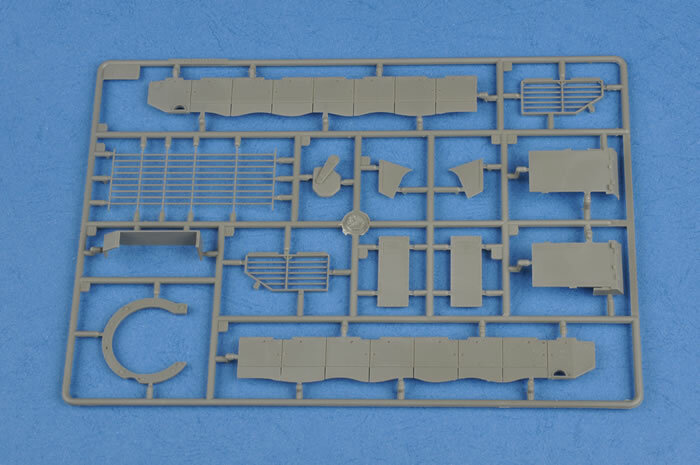 Moulded in the same easy to work with green grey plastic as the previously released Merkava 3D and 3D LIC, the kit somehow consists of 28 sprues containing over 1000 parts, which is a fair effort considering there is no turret, but the excellent individual tracks make up the bulk of the parts. 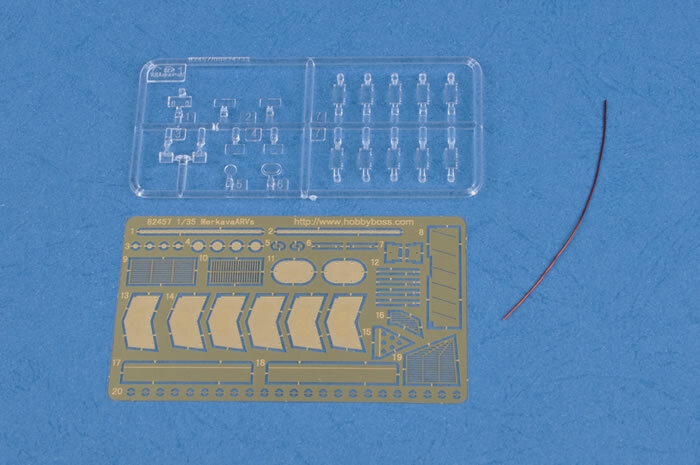 The kit also includes a photo-etched fret, clear sprue for the headlight lenses and periscopes plus flexible polythene caps for the running gear. The kit comes with no decals, just an instruction sheet and colour painting guide, which seems like a bit of a waste as there are no decals to place anywhere and the overall colour is Sinai Grey. 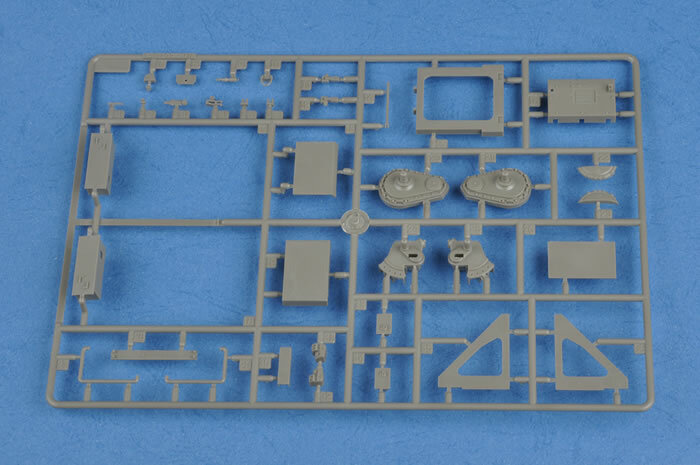 Like previous HB Merkavas, chassis numbers are included by default in the form of numbers on the edge of the sprues. I just sliced off the required numbers and glued them onto the rectangles moulded into the front and rear of the lower hull. Using a grainy photo as reference, one of the ARV prototype chassis number appears to be 895583. 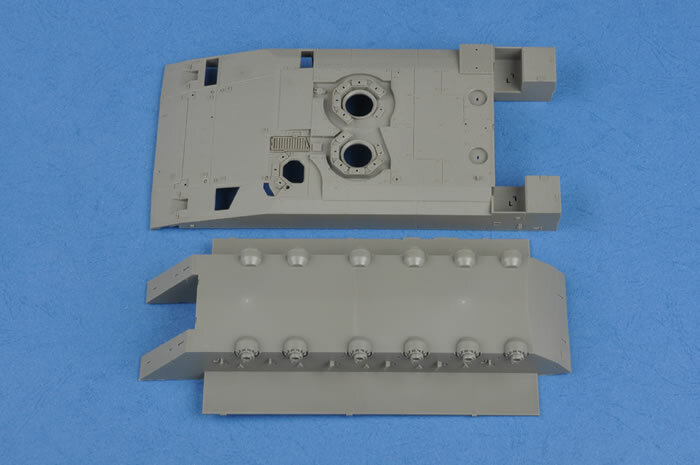 The upper hull comes with non-slip moulded on, and Hobby Boss has done a very good job of replicating the grainy texture non-slip found on IDF vehicles. In fact the kit is excellent in nearly every area with crisply moulded finely detailed parts except for the actual ARV parts. The crane is critical to the look of the vehicle and sadly this is very under detailed compared to the rest of the model. I just wonder if Hobby Boss’s intention was to build the ‘Namer’ APC prototype but changed their mind and rushed the ARV version out to market. This theory may be backed up by the fact Hobby Boss hasn’t given the vehicle its correct name of ‘Namer Achzaka’. The most glaring short cut is in the hydraulic and electrical cables and conduits, where these just sort of… end. They should run from the hull up to the side of the crane boom. The kit includes a random 10 cm length of copper wire, and I wonder whether this is to be used as conduit, however it is never called out during the instructions. 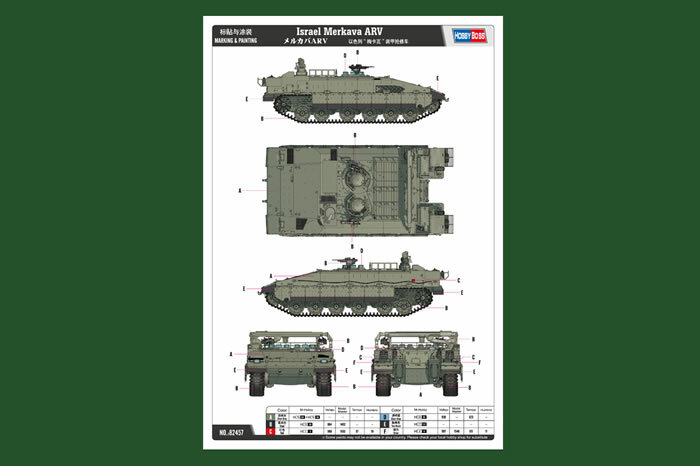 Another complaint I have about the Hobby Merkava 3 kits is that they only include all steel road wheels, whereas reference of the ARV shows them with a mix of rubber tyred and all steel wheels. 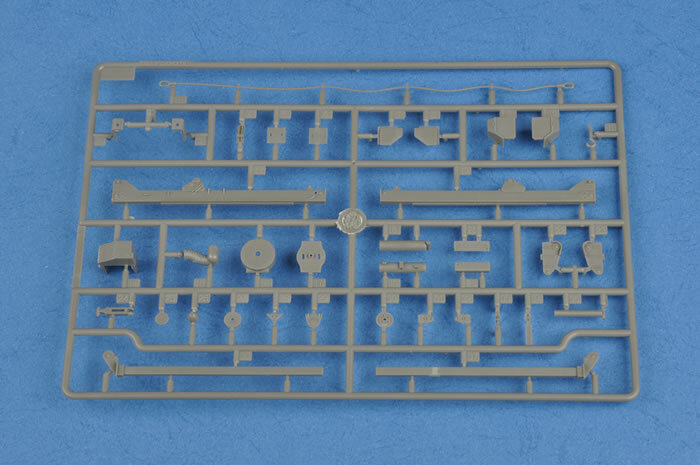 Frustratingly, the rubber wheels from their Merkava 4 fit on and look the part and I wonder why the sprues containing these wheels weren’t thrown in as an option. The model goes together with typical Hobby Boss ease, and with only some minor detailing such as crane conduits, aerials and a mix of road wheels, will look fantastic. Thanks to Creative Models Limited for the review sample.